There is a reason Paddington 2 did so well with critics and fans alike and is worth the price. This is one movie you definitely want to own. In 1958 British Author Michael Bond introduced us to the duffle coat wearing, marmalade-loving bear Paddington. Then in 1975 BBC television broadcast a series about the beloved bear and in 2014 Warner Bros. gave us a live-action feature film. Last year they followed that up with Paddington 2, which garnered both critical and audience acclaim once again reminding everyone why we loved the little brown bear in the first place. Now, The Blu-ray and DVD are coming to stores and are ready for purchase. As the film opens Paddington (Ben Whishaw; Cloud Atlas) is living with the Brown family in suburban England. He has basically helped to make his neighborhood a fun place to live and most everyone who knows him seems to love him (with a few exceptions). He has a nice life and is pretty content but he wishes he could share it with his Aunt Lucy (Imelda Staunton; Vera Drake). His compromise is to try and save up in order to buy her an old, expensive popup book of London. When he announces this to a large crowd who has gathered for the opening of the famous fair they all seem to think he is sweet and adorable (but we already know that). However, one individual has a more sinister plan. One night as Paddington is walking through town he sees a thief breaking into his friend's, Mr. Gruber's (Jim Broadbent; Gangs of New York) shop. Paddington follows the criminal inside and sees that he is stealing the popup book. Paddington follows the thief but he, unfortunately, gets mistaken for the perpetrator himself and is arrested and convicted of the crime. As the cute, little, brown bear ends up behind bars, the Brown family, especially Mrs. Brown (Sally Hawkins; The Shape of Water) starts investigating in order to clear Paddington's name. Whishaw does a terrific job of voicing the bear, which I can only imagine is no easy task as the pressure to "get it right" must have been immense. Luckily he does just that providing a soothing, innocent tone, which makes you want to love the bear all the more. Hawkins is a little "kooky" but lovable. Hugh Grant (Four Weddings and a Funeral) as old-time actor Phoenix Buchanan adds an evil dimension to the whole film while the rest of the supporting cast mesh well and complete the film, especially the group who befriends Paddington in prison. The Blu-ray is 1080p resolution with a 2.39:1 aspect ratio. The colors pop off the screen and details are very clear. The Dolby Atmos 7.1 audio is sharp and clean especially during the musical numbers (including a hilarious one involving Grant). 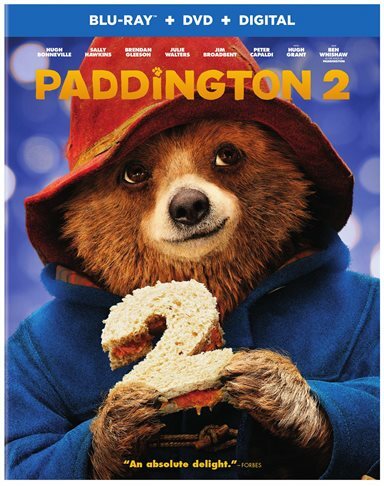 The special features include Paddington: The Bear Truth, Audio Commentary with Writer-Director Paul King, The Browns and Paddington: A Special Bond, Knuckles: A Fistful of Marmalade, The Magical Mystery of Paddington's Pop-Up Book,, The (Once) Famous Faces of Phoenix Buchanan, How to Make a Marmalade Sandwich, and the Phoenix Buchanan Music Video. Some of these features are as adorable as the movie. The film is sweet if a little cheesy but the "feel good" factor makes it fun for the whole family. There are a couple of very funny moments and even the "harden" criminals are almost sweet. The production value is top notch and the detail of Paddington's fur is exceptional. The story is not original but cute nonetheless. There is a reason the film did so well with critics and fans alike and is worth the price. This is one movie you definitely want to own. Download Paddington 2 from the iTunes Store in Digial HD. For more information about Paddington 2 visit the FlickDirect Movie Database.